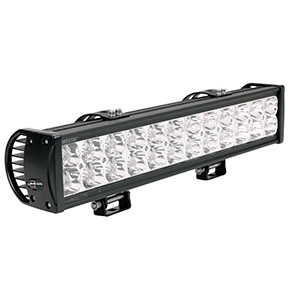 On the highway or off the beaten track, the darkest gloom yields readily to longer, high-performance LED light bars. 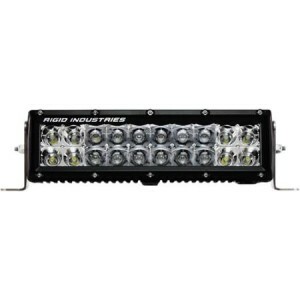 At the lower end of these, we have selected several 17-inch LED light bars with the power to brighten the blackest nights and the build quality to stand up to trail conditions. These light bars are bright, tough and sip power. Each of them is ready to stand up to dust, ice, rain, snow and even immersion. 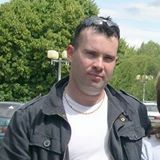 They are an ideal size to fit any recreational vehicle, truck, 4×4, boat and commercial equipment. This 17-inch LED light bar from Auxbeam features a popular combination flood and spot beam pattern, a unique vertical fin heat sink design and adjustable channel mounting brackets to match your installation requirements. Its 7,560 raw lumens of lighting power come from 36 long-life, 3W CREE LEDs arranged in two rows. Unlike many other light bars in this length, Auxbeam LED light bars use a sliding mount design that buyers love because it provides installation flexibility. 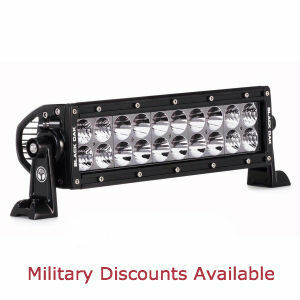 This 17 inch LED light bar is particularly popular because it is a “Goldilocks” size for most 4x4s, trucks, boats and ATVs. It features an IP67 intrusion rating, 6063 aluminum housing, but unfortunately does not come with a wiring harness. Auxbeam’s 17-inch light bar combo beam provides both penetration and breadth, which makes it ideal for hazard or game spotting as well as lighting up camp sites or work areas. It gains points for its excellent heat dissipation, polycarbonate lens and wide input voltage range. Overall, this bar is an excellent value. Eyourlife’s contribution to the 17-inch light bar category sports 36 high-brightness LEDs for a total of 108W of night-shattering power at over 7,000 raw lumens. 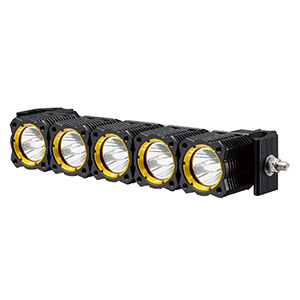 The LEDs are housed in a robust 6063 aluminum housing with deep heat sink fins along the entire back side. Its IP67 rating means it will stand up to wet, dusty or icy conditions well. Eyourlife’s 17-incher combo beam is more spotlight than floodlight with 24 of the 36 3W LEDs dedicated to that function. Six LEDs on each end provide illumination to the sides of the road or trail. The sliding channel mounts provide more mounting options than end brackets. Buyers like the fully-finned housing back as it dissipates heat well. You will have to spend another $15 for a wiring harness. 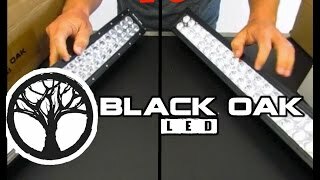 This is a budget light bar, so you will save money, but the LEDs have only a 30,000-hour rating and re-sealing of the quartz lens is probably in order. Even so, it is a great starter light bar that will outshine most car headlights easily. STV Motorsports offers the brightest 17-inch LED light bar in its class with 8,640 raw lumens of 6000K brilliant white light. It offers superb flexibility in mounting with two sliding channel mounts plus the ability to adjust the entire bar vertically for precise aiming. It boasts a rugged housing, 36 3W LEDs, an IP67 intrusion rating and a wide voltage input range from 9 to 32VDC. STV Motorsport’s 17-inch LED light bar outshines most of the competition with about 1,000 more raw lumens of brightness, which has resulted in loads of 5-star reviews from buyers. It has a sturdy housing that is fully finned for maximum heat dissipation, a shatterproof glass lens, 36 high-intensity 3W LEDs and IP67 resistance to snow, ice, water and dust. Only a six-foot wiring tail is provided, however. 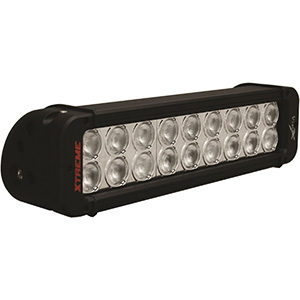 This Spot/Flood combo light bar is an economical way to upgrade your vehicle’s night vision. Installation is a breeze with channel mounts and vertical beam adjustment. For the price, you could easily buy two and run one low at the bumper and one on the roof. The first significant step up in equipping your car, truck or sports vehicle with robust lighting is the 17-inch LED light bar class. They put out tons of brilliant white light without busting your budget. All the ones reviewed here feature tough housings, a shatterproof lens and offer both narrow and wide beams in combination. They can be used in dozens of applications for work, trail, highway or waterway use.